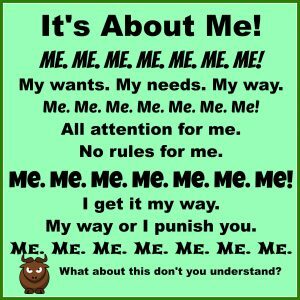 Enough About You – Back to Someone Interesting – Me! Monologue talking is one person going on and on about what they are interested in. Overtalking is holding onto the conversation and taking way more than their fair share of the time. If you are allowed to say something, you may get a nod and then it is “Now back to me.” Look at some of the motivations that cause individuals to take more than their fair share of the communication. Conversation should be a dialogue-a going back and forth process with both people getting to share their ideas. Healthy conversation is like playing catch. You throw the ball of conversation back and forth but one person does not go into a monologue. Most of us learned “My turn, your turn” in kindergarten. Narcissistic people learned “My turn. My turn. And still my turn. And you know what, it is always going to be my turn.” Some do monologue talking because they like the sound of their own voice or are overly fascinated with their own ideas. Often the need to control lies underneath other reasons for nonstop talking. Here are some other reasons people talk more than their share of the time. Anxiety Discharge. Some people talk nonstop out of anxiety and a nervous energy that they need to discharge. This is not narcissistic behavior but is their way to keep anxiety from building up. Control the Conversation. Some use a constant barrage of words to keep their anxiety down as they need to control the environment. They get heightened anxiety if there are pauses in the conversation or when they fear that something might be said which would threaten their sense of self. Excessive Energy Discharge through Talking. People with Attention Deficit Disorder and a high verbal fluency often talk nonstop. This is a disinhibitory pattern in the brain where impulse control is weak. I use the technique Eye Movement Desensitization and Reprocessing to help calm anxiety and teach the social skills of conversation about taking turns with these individuals. Problem Dumping. Some need to dump their problems on their friends and they’ve found a “big listening ear” who can’t set good boundaries about the back and forth, turn taking of healthy conversation. So all they can talk about is themselves and their problems. This is a boundary issue if you trained this pattern and allow it to continue. Wise up. Friendship is more than just one person talking about their problems. Drama Charge. Some keep talking as a way of keeping the drama up in their brain because replaying the drama with someone news turns on their endorphin’s. The OMG response and the release of adrenalin can be an addiction. Talk and Learn. It’s rare but a few people learn what they believe only when they are speaking out loud. They talk a lot to find out what they have to say! Fascination with the Small Details of One’s Life. Some talk on and on because they think that they are sooo interesting that others should be honored to listen to them. Any detail of their life can be fodder for nonstop detail. What they had for breakfast, a medical symptom, their latest injustice-minute details of their life that no person in their right mind would need to know. It’s called TMI- “too much information.” This reason puts them in the Moving-Towards Narcissism category. Remember that most of us have some narcissistic traits. Too many of the selfish behaviors add up to creating problems for others. I Get to Do It Because I Can. 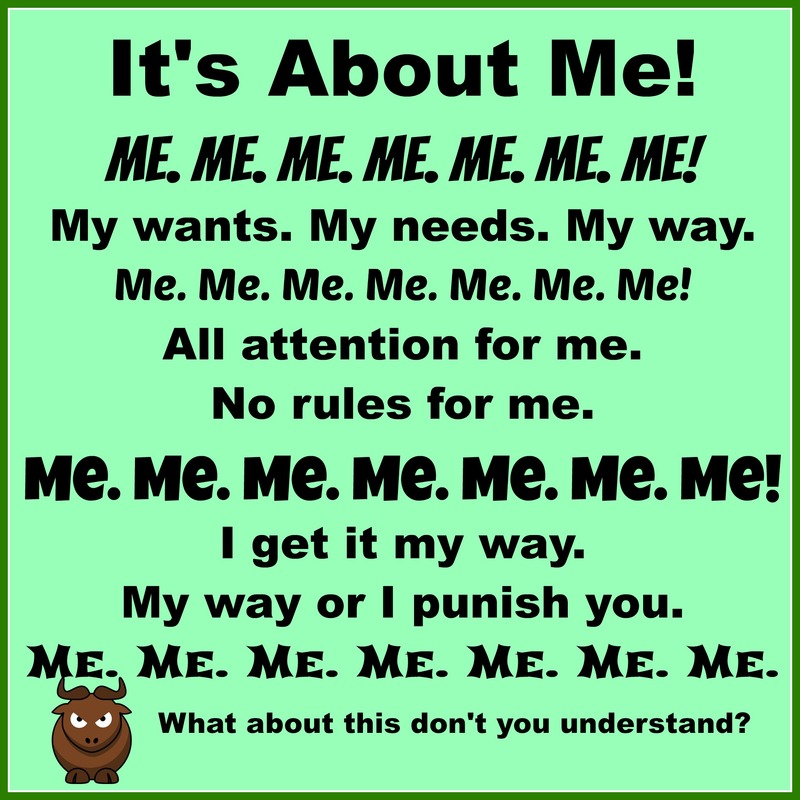 This is the mantra of the selfish person. Some talk on and on simply because you allow it! No one calls them on it and sticks to it. They do it because they can! Good conversation is like playing catch-you throw the ball of conversation back and forth. Each person takes a turn and then relinquishes the ball. It’s a game of cooperation not holding on to the center of attention. Sharing the conversation ball is a contract that good friends work out without even talking about it-the major rule is each person gets a turn to talk! Each agrees to listen to the other before taking a second turn. So if you have someone who hijacks most of the talk, it may be narcissism or it may be just anxiety. Note how much of the conversation is always about them and their problems. You have agreed to this on some unconscious level. Now that you are more aware of the dynamic between you, see if you can challenge it. Unaware people will let you. Selfish people not so much. If you try to get a few words in edgewise, a selfish person will ignore you or allow you two or three sentences and then turn the conversation back to themselves. You might say, “Hmm, I just noticed that you cut me off or turned the conversation back to you. Did you know that you did that? And then smile sweetly and wait to see how they deny it. Or get angry to get you to stop the challenge to his or her ego. You train a person as to what is allowed in the conversation by your staying and giving attention. That is right-you get what you listen to. Some people go on and on about the intimacies of their personal life. They do not notice that their over sharing is inappropriate. You can go into overload as the TMI from them is overwhelming. If he or she continues overriding any of your boundaries, state them again and get up and walk away. Show your power by talking with your feet. Take away their audience. Saying that you have to go might send a strong message that you will not listen to their bashing others, gossiping, venting and sharing details of their life that is none of your business. He or she may “call wolf” and come up with a crisis to get attention or act helpless to keep you sticking around. The martyr victim is part of the Needy Narcissism dynamic. “Poor me. This is how someone betrayed me today. I’m hurting so bad so you must be here for me constantly. My pain is greater than yours.” are all part of victim talk. But I’m the Selfish One and I want to Change! Some people are clueless about their give-to-me behavior and a subset of these can be helped. There is a broad range from just a little to a whole bunch in people who take from others and rarely give back. Those with just a few traits can change if they are willing to look at themselves honestly. My book, Your Quick Anger Make Over, gives more information and techniques for changing self-involved behavior. It’s a life-time project, but a good one to get into with many benefits. My Facebook page under my name sometimes posts ideas on working through your self-involvement that keeps you from having satisfying relationships. Hotchkiss, Sandy & Masterson, James F. Why Is It Always About You? : The Seven Deadly Sins of Narcissism (2003).